This week I didn’t finish. I didn’t even come close. Work was a terror: my Friday work day didn’t end until 3am Saturday, and My Sunday was devoured by phone calls managing dozens of work related problems. When it rains it pours right? That’s okay though, because apparently it’s stormy all over: almost no one else found time to paint either. Maybe it’s because tax season is coming to a close, who knows. This week no new mini projects caught my eye, but then I did spend most of this week working, so I might have missed something. If you found something awesome, let me know. This week I didn’t finish. I didn’t even come close. Work was a terror: my Friday work day didn’t end until 3am Saturday, and My Sunday was devoured by phone calls managing dozens of problems. I can’t remember the last time I wasn’t able to finish one of these bones, but hopefully this will be the only one I can’t get to for the foreseeable future. The shields and all their attendant fetishes look like a lot of fun to paint too. Arjen was the only painter to finish his project this week, and a great project it is. 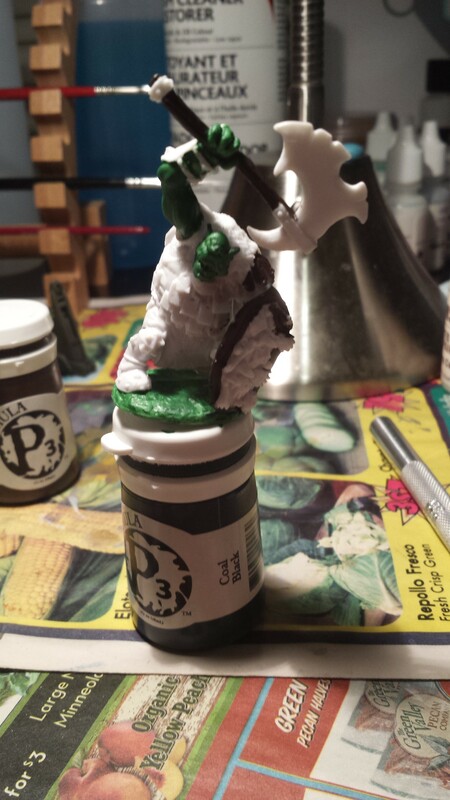 This ork has a Tolkien inspired color scheme, and I think it came out looking appropriately porcine. Great work Arjen! Update: Apparently Antonia had more problems with her email than she had painting this week. This one was worth the wait though. Her base though detailed, is simple compared to the bar she usually sets due to a time crunch she had this week, but other details more than make up for it. Check out the freehand work on the leopard skin. Bravo! Darkrasp Send pictures to caffeineforge@gmail.com by 4/20/14 at 9pm. 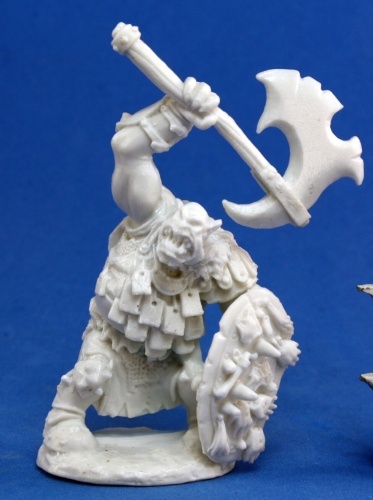 Village Rioter – Let’s see some OSL this week. 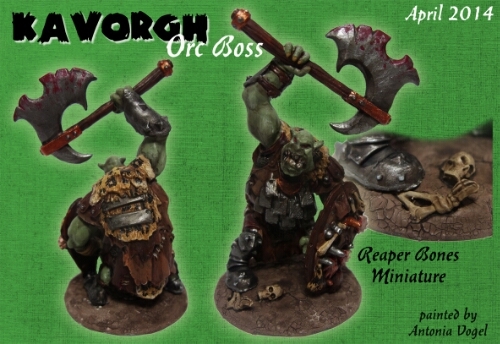 I posted in the Monday Miniatures thread on the Reaper forums, but I totally forgot to comment here! I had some real trouble with the color scheme I chose for this figure, which is why I missed the Monday target. I just finished Kavorgh last night, and he’s up on my blog. I intend to get myself back on track and have Darkrasp done in time! No matter how late you were Magnus, you still beat me, because I have yet to finish him!